There are three fully self-contained two bedroom units and two three bedroom units each featuring , a private bathroom, kitchen, and open plan lounge and dining area. Travelling in a large group? 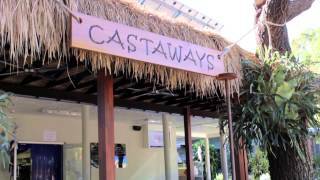 Castaways Moreton Island provides affordable dormitory-style accommodation with bathroom, kitchen and dining. If you'd rather a spot of Glamping, check out their Glamping at Castaways page for more details. Don't have a four wheel drive? They offer on-island transfers to get you to your accommodation and can recommend tour companies to show you the island and facilitate your adventure. Just a short stroll from the beachfront our self contained units are perfect for that secluded and technology-free holiday with family and friends. Each unit sleeps between four to seven people across two bedrooms in bunk-bed arrangements. The master bedroom also contains either a free-standing or bunk-style double bed. Please note that the peak and off-peak seasons vary - check the website or when booking. Linen hire costs extra. Head to the on-site restaurant open for breakfast, lunch and dinner daily (please check opening hours on-arrival). Or fire up one of the communal outdoor barbecues. There is an on-site liquor and convenience store, where you can also book exciting snorkelling, sand boarding and lighthouse tours with their experienced local guides. Travelling in a large group? Castaways Moreton Island also conveniently provides affordable dormitory-style accommodation with bunk beds, private bathroom, open plan fully self contained kitchen and dining area. Their larger dorm sleeps 39 guests and also has a second bathroom and large lounge area. Their smaller dorm sleeps 25 people.